Earlier this year we were involved in a workshop which took place at The Swan House, Atlanta. 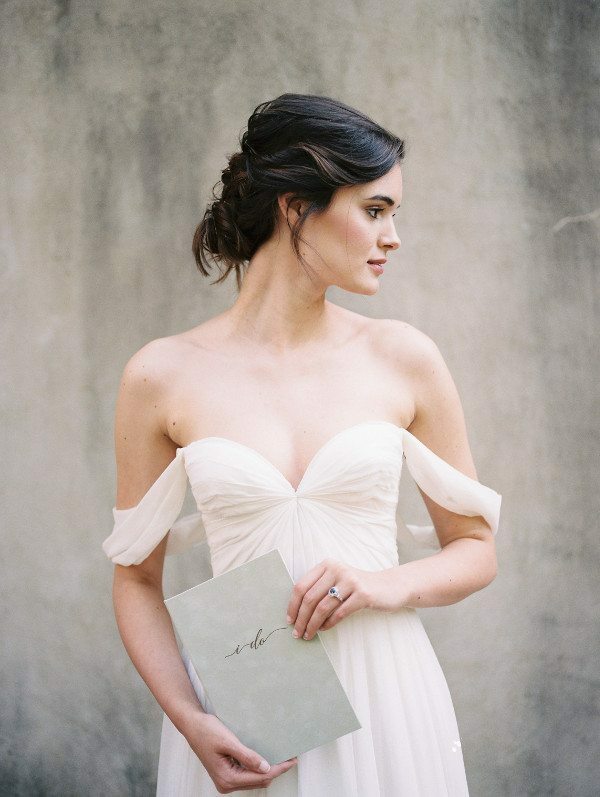 Film photographer Holly Von Lanken captured this photo of a real bride-to-be model holding our mint green flocked velvet vow book against the wall by the grand fountain. To date it is our favorite photo. There’s just something about film that captures the mood and this particular photo is a winner in our book. (No pun intended). Perhaps it is the hard stone wall behind the bride that gives her a softer feeling. It’s the dress, lazily falling from her petite shoulders as she delicately holds the book and gazes off into the horizon. What is she thinking? You can almost reach out and touch her, the dress, the book…or ever-so-carefully replace the strand of hair that has fallen onto her face, smoothing it to the back of her head. Featured on Trendy Bride’s blog July 6, 2016.